The Medersa Bou Inania is the finest and the greatest of Fez’ colleges, it is located down Talaa Kebira from Bab Bou Jeloud. It is an icon of great construction in Morocco; it was built by the Merenid sultan Bou Inan during the period from 1351 and 1357. It was restored and stunningly decorated with colorful geometric mosaic artwork and carved plaster. 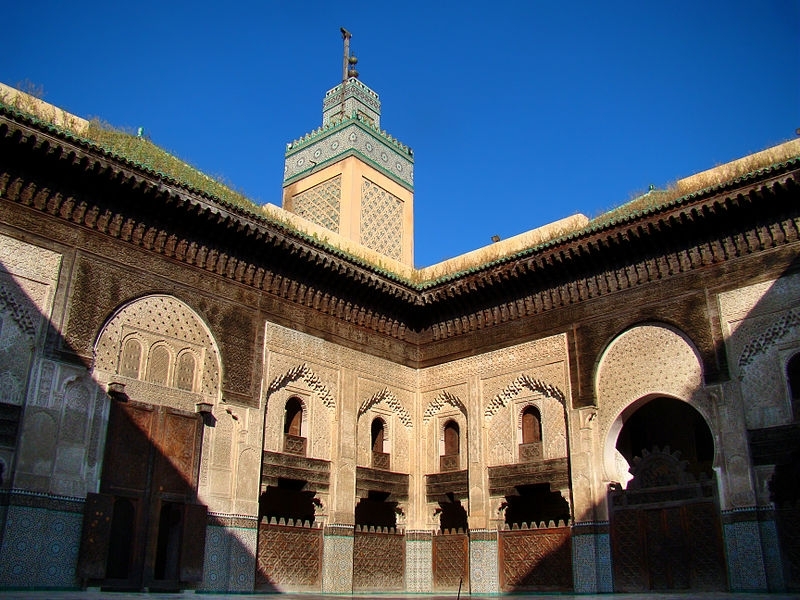 An amazing fact about The Bou Inania is that it hosts a complete mosque inside its walls. Fez, one of the most amazing cities in Morocco, is a stunning city full of landscapes and natural mountains. One of the greatest icons is the medersas (Koranic universities) which bear living witness to the city’s intellectual and scientific past. They are the work of the Merinid sultans, and played a prominent part in political, educational, and cultural life. Founded in the 13th century, the first to be built was the Seffarine Medersa, outstanding for the restrained elegance of its decor. The Bou Inania Medersa is remarkable for the sumptuousness of its architecture - its wealth of sculpted stuccowork and carved cedar wood, and its rich onyx and marble decor. Ibn Khaldoun taught there. The El-Attarine Medersa was built in 1325 and is one of the wonders of the city, a true masterpiece, its decor - sculpted marble and calligraphy, cedar wood arches, finely worked mosaics and arabesques - of breath-taking delicacy. 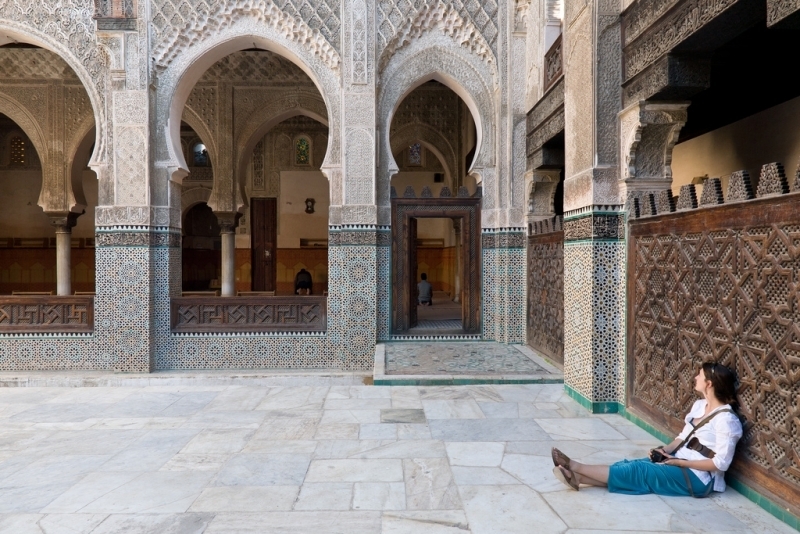 The Cherratine Medersa was built by Sultan Moulay Rachid in the 17th century, and could accommodate up to two hundred students at a time. In order to well explore the medina, you should definitely start at the Bab Boujlloud Gate. 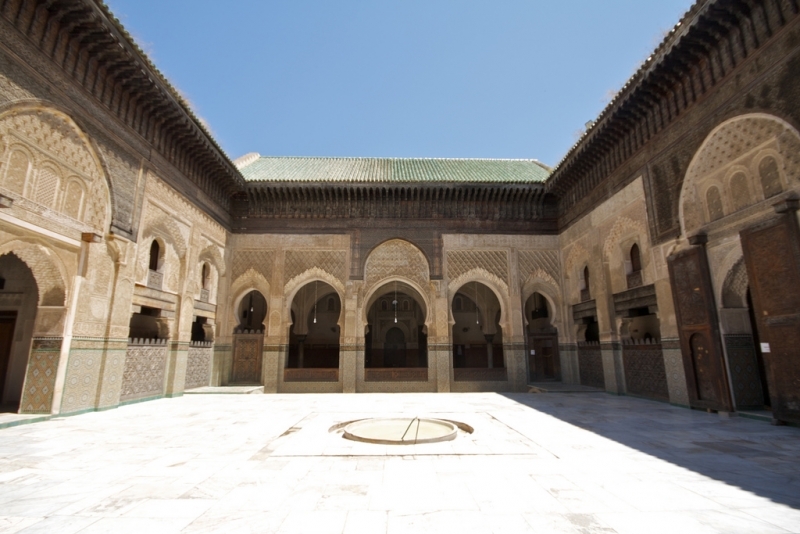 The most spectacular monument to visit first is the vast Bou Inania medersa, a great cedar woodwork, you will be stunned by its sculptured stucco and its marble and onyx decoration. As you continue along the road to Talaa Kebira Street (the big climb), you will surely get amazed by the Tijani zaouïa (zaouïa, sanctuary of a religious brotherhood) and the instrument makers' souk. 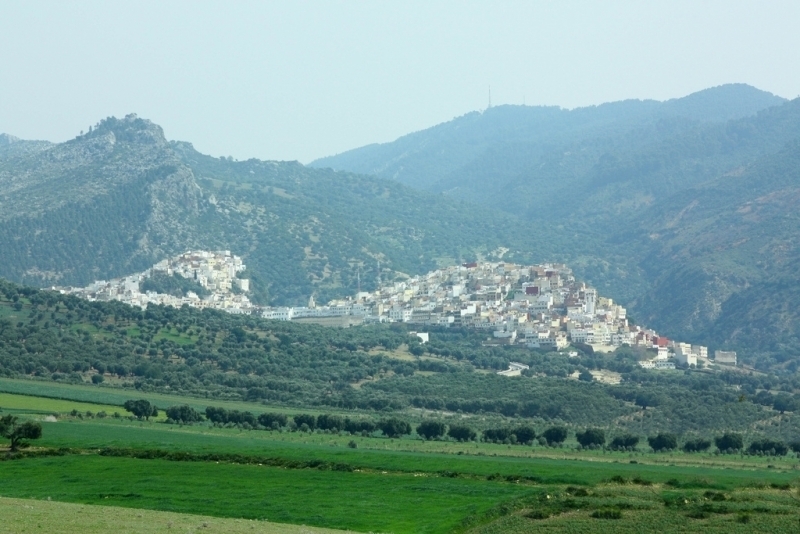 Also, another must visit place is the mzara (shrine) of the ancient sovereign Moulay Idriss located at the place where he took the decision to build the town. Enjoy the magnificent carved caravanserai at the square houses the Museum of Wooden Arts and Crafts. Also, the kissaria or the covered market, where jewellery and fine fabrics are on sale, is a place that you can’t miss. 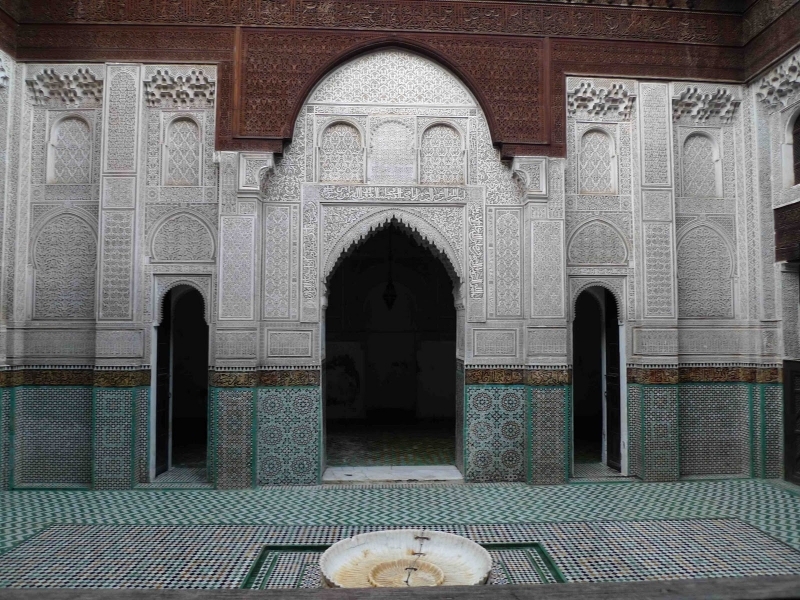 Explore the most visited and revered attraction in Fez: the zaouïa of Moulay Idriss, who is the founder of the town. The tanners' quarter is located just before the Andalusian quarter with its mosque and the Es-Sahrij medersa. You will walk by the old Dar Batha Palace whose Arabo-Andalusian style makes it a museum open to visitors from all over the world. It gives an excellent overview of all the local products of the town reputed for its craftsmen's skills. The museum also hosts some of the concerts of the Festival of World Sacred Music which takes place every June. The Moqri Palace, hidden nearby behind high white walls, houses treasures of a rare architectural refinement. Spend the night away by spoiling yourself with a night in the Jamaï Palace, previously the residence of a rich vizier now turned to a hotel. Fez is a rich city in history and culture. full of stunning mountains and hot springs that will leave you breathless, discover the amazing Marrakech through one of Morocco tours!